Contepomi is one of the stars of world rugby and is set to lead the Pumas into a new era after being named captain in 2008. The former U19, U21 and Sevens international made his Pumas debut against Chile in 1998 and has been an integral part of Argentinean rugby ever since. The multi-talented Contepomi made his international break-through at fly-half and while he has played much of his rugby in that position he recently has found his place at inside centre with Juan Martin Hernandez preferred at No.10. He was named in José Luis Imhoff and Alex Wyllie's squad for the 1999 Rugby World Cup squad, where the Pumas made the quarter-finals for the first time. Marcelo Loffreda took charge of the national side in 2000 and Contepomi retained his place, eventually nailing down a starting berth 2001. He notably notched a full house on his way to 25 points in the 30-16 victory over Wales in Cardiff on 10 November 2001. He was also part of the 2003 Rugby World Cup squad, featuring in three of the Pumas' pool games as they were forced to play four games in a fortnight. 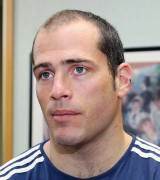 In 2004, Contepomi weighed in with 14 points as Argentina condemned France to their first defeat at the Stade Velodrome in Marseille. He also faced the British & Irish Lions in 2005 and at the end of 2006 he was part of the Pumas side that scored their first ever victory over England at Twickenham. The Pumas stunned the rugby world with an inspired performance at the 2007 Rugby World Cup in France. Contepomi was a key player throughout the campaign - featuring in all seven matches as the Pumas claimed third place in the sport's global showpiece. He was the second highest points scorer in the tournament - notably kicking four penalties in the shock opening victory over hosts France and 11 points in both the pool victory over Ireland and the quarter-final against Scotland. His displays saw him shortlisted for the IRB Player of the Year award. Following the retirement of veteran scrum-half Agustin Pichot, Contepomi was handed the captaincy of the Pumas in 2008 by new coach Santiago Phelan ahead of the opening clash of the year against Scotland. A knee injury suffered in Leinster's Heineken Cup sem-final victory over Munster in 2009 ruled him out of action for over a year but he returned to Pumas colours in 2010 and bagged a 31-point haul in their 41-13 victory over Six Nations champions France. His rugby roots are in Buenos Aires but it was not until he moved to English club Bristol in 1999 that he came to wider attention. During his four-year stint with the West Country side he helped steer them to the 2001-02 Premiership Final at Twickenham where they lost out to Gloucester. In 2003, he switched to Irish province Leinster and went on to become a high-profile figure in the Celtic League. He had a stand-out year in 2005-06, steering Leinster past Heineken Cup holders Toulouse on French soil in the quarter-finals of that year's competition and to runners-up spot in the Celtic League. He was also the top scorer in both competitions that year. Contepomi and Leinster went one better in 2007-08 by claiming the Celtic League crown. Injury prevented him sharing in Leinster's 2009 Heineken Cup triumph after which he moved to French Top 14 side Toulon where he continued his rehabilitation from injury before adding impetus to their push for domestic and European honours. Contepomi announced he would leave the Top 14 giants to take the fly-half helm at Stade Francais in time for the 2011-12 season. His arrival in Paris will have to wait till after the World Cup having been named in their 30-man squad for the tournament. The brother of fellow Pumas international Manuel, he combined his career with medical studies at and finally collecting his degree from the Royal College of Surgeon in May 2007.